With the recent spring TiVo Premiere is based on the new “Series4” hardware platform with a faster dual-core processor, twice the memory, and improved I/O. The added processing power is used to support a new high-definition interface with a video window, much faster network transfers, and robust video playback with full 1080p output. You might have TiVo Premiere XL4 recordings in your living room and have some interesting Tivo movies or videos on your Mac. This article will show you how to convert TiVo Premiere XL4 recordings to 720p MP4 for playing on Mac. It would be great if you can transform TiVo Premiere XL4 recordings to 720p MP4 and enjoy them by sitting comfortably on your cozy Sofa! Here, this guide to explain how to Transfer Tivo recordings to Mac with TivoDecode Manager, as well as how to Convert Tivo recordings to Mac. Step 1: Transfer TiVo recordings to Mac. Before working with TiVo files on Mac OS X, you need to first transfer TiVo videos to your Mac. The best way is to download the free TivoDecode Manager and transfer Tivo TV shows and movies to Mac. Run the app, enter your TiVo’s IP address in the TiVo IP Address box. Next click the Prefs button in the lower-right corner. Fill in the Media Access Key. A list of shows on your TiVo will appear in the Now Playing list. Select the show and click Add Show To Queue. The selected show now appears in the Download Queue list. Click Download Location to select where you want to save it. Step 2: Convet Tivo recordings to 720p MP4. The TiVo HD Video Converter for Mac users comes with supports for a wide range of video editing software and media devices, including Adobe Premiere Pro, Avid Media Composer, Final Cut Pro, iMovie and Final Cut Express. 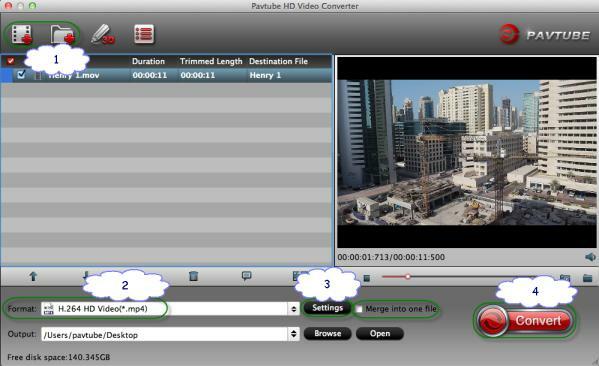 It helps you convert TiVo recordings to any editable format like ProRes, AIC. mov, MPEG-2, DNxHD, etc as you need without any quality loss. Download the program and follow the guide below. Step 3: Import Tivo recordings. Launch the utility and here pops up an intuitive interface. 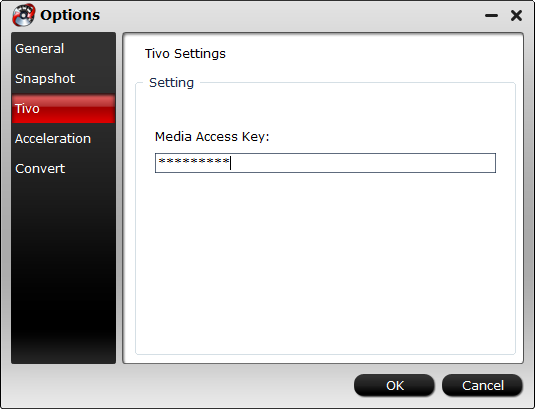 Click the “Option” button and go to the TiVo tab to enter the Media Access Key (MAK) for your TiVo videos. Then click the “Add Video” button to import the .tivo files. Step 4: Choose MP4 as output format. After you finished editing, you then choose output format from “Format” drop-down list and specify the format under iPad profile among the three options. Here, you can select”HD Video > H.264 HD Video(*mp4)” as output format. Here, you need to click “Settings” to change the size as “1280*720” for mp4. Please note that the higher bitrate you choose, the better video quality you will get. Click the big red “Convert” to start converting Tivo files to 720p MP4 that suits for playback, sharing, editing and burning. Wait for moments and click “Open” to locate the converted video.